Ancestor Guintrand de Noailles lived in the second half of the 12th century. His descendant Henri de Noailles (1554-1623) is the first Comte d'Ayen. His grandson Anne de Noailles, 3.Comte d'Ayen (1620-1678) is created Duc de Noailles in 1663. In 1737 Louis de Noailles (1713-1794), the heir to the title, is created Duc d'Ayen, which becomes the title of the eldest son of a Duc de Noailles. Louis´ younger brother Philippe de Noailles (1715-1794), French ambassador in Madrid, is created Duque de Mouchy in 1747 (recognized as French Duc de Mouchy in 1817). This branch uses the courtesy title of Prince de Poix for the eldest son and heir. 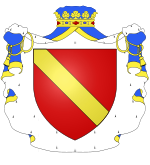 The 'principality' of Poix was bought by the family Noailles in 1718. 85. Mary More * … + ..-1-1841, Dr van Alexander M.
91. Wenceslada Fresco González * … + …; Dr van Teodoro F. en Carlota G.
108. Hercule Victor Gilles de Fontenailles * 1797 + château de Morains, Dampierre-sur-Loire 15-1-1862; Zn van Alexandre G. de F.
110. Jules de Cossette * 28-12-1793 + …; Zn van Edouard de C.